The Kelani Shakthi program, a unique CSR of Kelani Cables PLC is progressing well in the Jaffna peninsula. The course is the Tamil version of Kelani Saviya CSR which is conducted at the University of Peradeniya to add value to the self employed electricians island wide irrespective of their basic qualifications. The Kelani Shakthi program has been well received by the youth in the North said Jayantha Wijesinghe course coordinator, after a recent visit to Kilinochchi. Wijesinghe on instructions of Kelani Cables Director, CEO Mahinda Saranapala recently visited the Faculty of Engineering of the University of Jaffna to assess and report on the progress of Kelani Shakthi program carryout in Jaffna. Students who have minimum GCE (O/L) can apply for the one year course in domestic and industrial wiring at both universities. The course was designed by the Professor in Electrical and Electronic Engineering, Professor Janaka Ekanayake of the University of Peradeniya (UoP) in 2007. 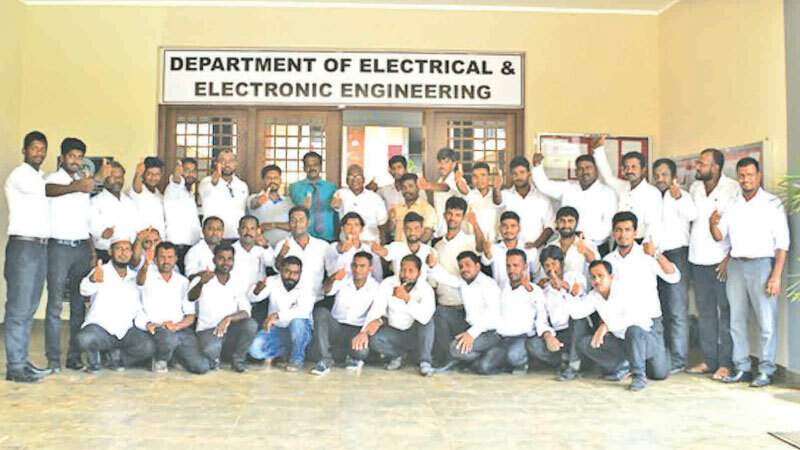 As a result of the MoU signed by CEO Kelani Cables Plc , Mahinda Saranapala and the VC of the University of Jaffna ,Senior Professor Wasanthi Arsaratnam in 2014, the program was launched in 2015 with 28 self employed electricians in the area. Accordingly so far 58 students have already passed out as professional electricians and are doing well in the Jaffna region. The current Kelani Shakthi program is in progress with 47 students and their convocation will be held in February 2019. Senior lectures and professors in the Electrical and Electronic Engineering Department of the University of Peradeniya as well University of Jaffna are conducting the weekend classes. The course consists of nine modules and three levels and at the end of the each level an exam is held .Students who have successfully completed all the three levels is presented with a valuable certificate from the university. The Kelani Shakthi program is running under the direct supervision of the Dean of the Faculty of Engineering, UoJ Professor A. Athputhraraja and the Course Director, Senior Lecturer T.Thiruwaran. Visiting Lecturer Annopradeepan is conducting the classes since 2015. Director /CEO Saranapala was impress to note that T. Jehanath of the first batch of student has secured employment as a Demonstrator in the Faculty of Engineering as a permanent non academic staff member of the University Jaffna Faculty of Engineering. Furthermore Kelani Shakthi Coordinator Wijesinghe had also met another second batch student, Nadarajah Prasad who is employed as a Industrial Technician in a well reputed private firm. These high profile appointments of Kelani Shakthi students bear ample evidence to the success of the CSR program, Wijesinghe added.